Two things you must know before reading my review on the Mary Poppins sequel. I didn’t like the original, even as a young child, I found it boring, and completely uninteresting. Not much has changed, you might dismiss my review, “oh he doesn’t like musicals”, which isn’t true; I love Chicago and Moulin Rouge. He doesn’t like PG rated family movies, also not true, I quite enjoyed Paddington and Christopher Robin. So what is it about Mary Poppins I can’t get into? 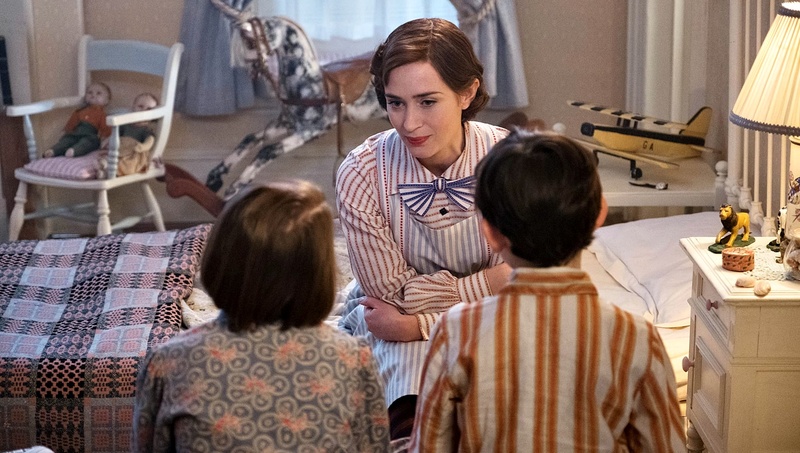 For one, Mary Poppins Returns fully embraces the musicals of yesterday, heavy on song and dance, very light on story. For much of the film the characters speak about how little time they have left to solve their problems, yet there is always time for ten minute song and dance interludes. Blunt’s performance is fine for a Golden Globe nomination in comedy/musical, but it would be a crime to vote her in over Toni Colette or Yalitza Aparicio. Blunt’s limitless range of talent has been on display for years now, including her SAG nominated performance in A Quiet Place. Michael (Whishaw) and Jane (Mortimer) Banks have grown up with careers and family’s of their own. Michael’s wife has passed away, and Jane comes round as often as she can to help her poor brother with the three children. Their loving maid Ellen (Walters) is losing her marbles with grey in her hair and now their childhood Banks home is in danger of repossession. Youngest John Banks (Nathanael Saleh) takes his father’s old kite out in a windstorm and catches a nanny in the sky. Mary Poppins (Blunt) returns in the nick of time to help the boy from long ago with his current predicament. They must find stock notices to prove to the greedy bank owner William Weatherall Wilkins (Firth) that the Banks family has enough money to cover a loan Michael regretfully took and failed to pay off. The script works very hard to co-mingle the events and characters of the past with the present ones and that’s the most creative element. Nostalgia simply isn’t enough for me to enjoy a film. It hasn’t worked in the past for sequels of movies I truly love and it doesn’t work here. It will work for many who not only grew up with the original 1964 Mary Poppins, but as they passed it down through generations. The script works very hard to co-mingle the events and characters of the past with the present ones and that’s the most creative element. The kids from the original have matured into their parents and the kid outside on the bicycle has found a way to turn that into a profession. Some of the smaller touches will be lost on a new generation, unfamiliar with the story. A refresh of the original would serve the viewer well before checking out the new one. The best new original song is “The Place Where Lost Things Go”, which has been shortlisted by the Oscars. It’s a moving tune sung by Blunt to help the children cope with their mother’s absence. It’s one of the few songs where the narrative doesn’t completely stop just so a song and dance number can be had. On the flipside, the worst song occurs when Poppins, the children and Jack the lamp lighter (Miranda) get lost. “Trip A Little Light Fantastic”, the other song shortlisted for consideration. Even though their father is worried sick at home, they stop for a song and dance session with Jack’s lamp lighting buddies that lasts for an eternity. One of the films highlights features Poppins cousin Topsy played enthusiastically by Meryl Streep, reuniting The Devil Wears Prada co-stars for the third time. Disney sets the record for the longest time span between an original film and sequel of 54 years. Mary Poppins will be an experiment to see if a new generation will embrace something from the past or if this latest Disney reinvention only appeals to nostalgists. Disney’s Mary Poppins sequel aims to please those already fans of the original and does little to appeal to a new generation.